One of my favorite holiday traditions is sitting down with my kids to write letters to Santa. It is an activity the kids are excited to do, it gets us in the holiday spirit, and it is always an enlightening experience for all of us. Not only does Santa come away with some good ideas, my kids learn to identify needs vs. wants, to prioritize, and to set realistic expectations even as they ask for the moon. There’s something about actually sitting and writing the list that forces them to decide what is really important to them and what they can do without. If they end up with a lot of things on the list, seeing it in writing helps them realize that Santa might not be able to fit it all in his sleigh, so it might be prudent to prioritize. Sometimes they surprise me with just one or two things. Sometimes they don’t have anything in mind and want Santa to surprise them. But once the letter goes in the mail, sorry, no changes allowed. That’s why you have to check it twice. In our home, we also write follow-up letters to Santa that we leave out on Christmas Eve along with a few chocolate chip cookies. 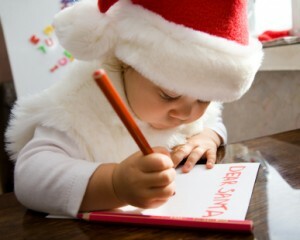 It is a reminder to Santa about the first letter written and the multitude of requests. Santa then leaves a note back, commenting on the children’s shining moments through the year. Maybe that’s the Santa letter we love the most. It is not there when we go to bed, but is always there when we wake up in the morning. It brings the magic of Christmas to our children, for as long as Santa exists to them. I agree that this is a wonderful tradition. I am going to save all of my son’s letters to Santa and put them in a keepsake box or scrapbook. I am sure they will be really fun to read when he grows up. Such a great tradition! I particularly love the thank you not to Santa on Christmas Eve. Our baby boy is just 4 months, so we’re starting to formulate some early traditions. I’ll definitely have to keep this one in mind for when he’s a bit older!